Sacred cause? Or savvy con-job? Marriage may be the future's only (& often mandatory) relationship recognized in law. "Gay" was long thought to live on the far left fringe of social convention. Personal reaction to gay issues has been a litmus test of liberalism. But the Great Gay Marriage Battle is in fact a fight on the right: a struggle for the power -- backed by state power -- to define a conservative institution. To reinforce crumbling conventions. To say which of our richly varied relationships deserve legal recognition. And which do not. Whatever our sexuality. What a weird goal to call "gay." Nothing about it is liberating. Despite glowing mantras -- Equality! Dignity! Choice! -- avid demands for gay marriage have little to do with substantive equality, true choice, or dignity rooted in personal autonomy, freedom of conscience, and wider human justice. So why do so many of us see it as a sacred cause? Or at least a decently liberal idea? In an attempt to answer that question, and suggest better directions, I launched this section of my website in October 2002. It has got very big (I am known to go on). This is a brief overview of key points -- pointing to what I've called "Quick leads," most also brief. Those leads are linked to pieces offering thoughts at greater length. Some thoughts on offer here go beyond what's noted on this page. You can "Go Beyond" via a link at the bottom of this section's lead page, or click on its "Contents" link. In "Spouse touting," this section's introduction (not brief), I say: "From 'spousal benefit' battles to the 'gay marriage' slog, we have asked stupid questions (& got stupid answers)." 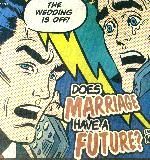 Reducing our many and varied relationships to "Gay Marriage: Yes? or No?" is very stupid indeed (if for some quite useful). And all too easy: it fits the media's facile frame. The right question -- What role should the state play in our intimate relationships? -- was asked in a January 2002 report: Beyond Conjugality: Recognizing and Supporting Close Personal Relationships Between Adults. All but one of its proposals went way beyond easy answers on gay marriage -- so were widely ignored by marriage mavens and the media (even the gay media). And hence by almost everyone else. We stayed stuck in the facile frame, some of us quite comfortable there. The words we use shape how we think. Even what we are free to think. The Great Gay Marriage Drive's glittering generalities -- Equality! Dignity! Choice! Acceptance! -- have been deployed as weapons of mass thought destruction. Few have pondered the attitudes likely lurking behind the mask of sanctimonious platitude. We have been silenced by smarm. Or shamed by hyperbole: Segregation! Back of the Bus! Apartheid! -- glorified groans from what must be the world's most comfortably oppressed class, borrowing the cries of people long facing truly brutal oppression. It's a phenomenon worth some sober thought: on the politics of ennobled victimization. Common-law: Paying the price of "equality"
The mantra of "Choice" is given the lie by involuntary common-law status. Couples living together for just a year face mandatory joint tax returns; in Ontario they can lose social benefits after just three months -- unless they can prove they're not sharing a conjugal bed. Gay marriage mavens, many well-off, have never challenged this violation of choice and its obligatory burdens -- borne mostly by people poor, indigent, or disabled. Have those demanding the "right to be just like everybody else" ever thought what it might cost anyone else? It might seem not. But apparently they have -- if most knowing they won't have to pay the price themselves. Or saying: If I have to pay, so should you -- in the name of absolute "equality." Whatever our material inequalities. Who are "we"? Is there a "we"? Do all the richly varied lives encompassed by the term "gay community" -- even made plural and "LGBT" inclusive -- fit the tight frame of comfortably coupled domesticity? Of course not. Yet that's how we're being sold by some among us. Even to ourselves. "Liberationists" vs "assimilationists"; "respectable homosexuals" vs "outrageous queers"; working boys up against Bay Street hustlers; potential street fuckers facing "nice" gay folk who'd gladly see them locked up.... it is in these messy engagements that we ponder and create ourselves. It is folly to think, in the spaces we have fought so hard to carve out, that we must all live and think the same way. We created those spaces precisely to let us live differently. Even from each other. But keeping those spaces open -- to the freedom of living, thinking, and loving in the many different ways we do -- depends on not letting them be closed down by anyone trying to tell all of us exactly how we should live. Especially anyone trying to get the state to tell us how we must live, enlisting its power in a bid to impose their values on everyone. Social change begins with talk: people sharing thoughts, refining them; thought growing to action. Don't groan -- organize! Find out what you can do to reclaim your life from the forces of stultifying convention. And to help shape a future truly just, humane, and free. Image: Cover illustration by Chris Lam, eye, Jun 27, 2002, for Karen Bridson-Boyczuk's "I do, I don't: Traditional heterosexual marriage could be replaced by a whole new wave of state-sponsored legal unions." This was one of the very few media pieces to take a close look at Beyond Conjugality -- if still buying, as nearly everyone did, marriage mavens' spurious mantra of "Choice."